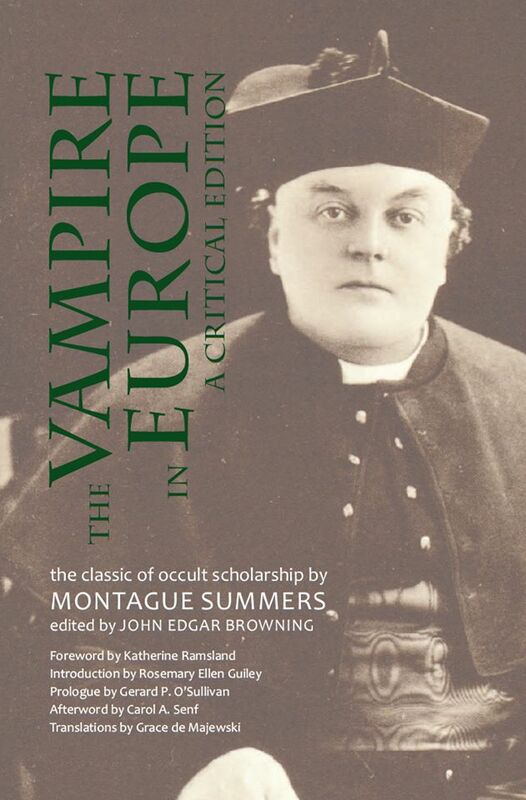 I have been waiting for a critical edition of Montague Summers’ The Vampire in Europe (1929) for a long time. Just over three years, in fact. You see, in 2011, Apocryphile Press published The Vampire, His Kith and Kin: A Critical Edition, which was edited by John Edgar Browning—who’s also edited, or co-edited, works like Draculas, Vampires, and Other Undead Forms: Essays on Gender, Race, and Culture (2009) and Dracula in Visual Media: Film, Television, Comic Book and Electronic Game Appearances, 1921-2010 (2010), among others. The critical edition of Montague Summers’ seminal 1928 work, The Vampire, His Kith and Kin, was a welcome advancement over the glut of haphazard reprints largely derived from the Sacred Texts online version that you’ll find on Amazon. The 2011 critical edition had an introduction by Rosemary Ellen Guiley, an afterword by Carol A. Senf, a foreword by J. Gordon Melton, an excellent prologue by Gerard P. O’Sullivan and translations of some of Summers’ direct foreign language quotes by Grace de Majewski—and, it was pretty cheap. A dream work. His criticism also provoked one of the greatest articles I’ve ever read: “A Delayed Demonologist” (Petersen 2011b), which was a fantastic taste of what could’ve been in a truly critical examination of Summers’ work. Despite that, the critical edition is still a handy tome; O’Sullivan’s investigation into Summers’ shady background is a great addition to other biographic studies of the man. That now brings me to the new one, the follow-up work I’ve been waiting three years for: The Vampire in Europe: A Critical Edition. Yesterday, I saw its cover posted on Facebook and tracked it back to John Edgar Browing’s Facebook account. I asked him when it would be available. He said, “We’re probably looking at about a month, but I’ll keep ya informed”, then added “Tomorrow [today] I’ll try to put together a few excerpts for ya.” Sweet. I’ll keep you informed, too, as I’ve presently got no idea on what’ll make this one special—O’Sullivan’s piece is gonna be hard to top, after all. The main difference I see, from the cover, is that Katherine Ramsland will be writing the foreword. You might be familiar her books The Vampire Companion: The Official Guide to Anne Rice’s The Vampire Chronicles (1993; 1995), Piercing the Darkness Undercover with Vampires in America Today (1998) and The Science of Vampires (2002), among others. So, it’ll be interesting to see what she comes up with. Either way, I’m looking forward to this one—and I hope you are, too! Hogg, Anthony. 2011a. “Discussion of Dates and an Interesting Find.” Diary of an Amateur Vampirologist, August 29. Accessed September 16, 2014. http://doaav.blogspot.com.au/2011/08/discussion-of-dates-and-interesting.html. ———. 2011b. “On Criticism.” Diary of an Amateur Vampirologist, September 13. Accessed September 16, 2014. http://doaav.blogspot.com.au/2011/09/on-criticism.html. ———. 2011c. “Critiquing the Critical.” The Vampirologist, October 20. Accessed September 16, 2014. http://thevampirologist.blogspot.com.au/2011/10/critiquing-critical.html. Petersen, Niels K. 2011a. “A Sustained Study in Projection.” Review of The Vampire, His Kith and Kin: A Critical Edition, by Montague Summers; edited by John Edgar Browning. Magia Posthuma, September 10. Accessed September 16, 2014. http://magiaposthuma.blogspot.com.au/2011/09/sustained-study-in-projection.html. ———. 2011b. “A Delayed Demonologist.” Magia Posthuma, September 24. Accessed September 16, 2014. http://magiaposthuma.blogspot.com.au/2011/09/delayed-demonologist.html.